Harvey Hosein was able to offer some resistance on a poor opening day for Derbyshire. The 22-year-old wicketkeeper made 78 from 172 balls out of 197 with Ben Raine and James Weighell each taking three wickets. Chris Rushworth claimed the first wicket of the County Championship season with the first ball of the match but Derbyshire hit back through Luis Reece to reduce Durham to 41 for 3 at the close. Derbyshire’s decision to bat first was surprising given a grassy pitch and overcast conditions and they were left to regret it as Rushworth struck twice in his opening over. Reece edged to second slip before the third ball knocked out Wayne Madsen’s off-stump and Rushworth then saw Tom Lace dropped by wicketkeeper Stuart Poynter in his next over. 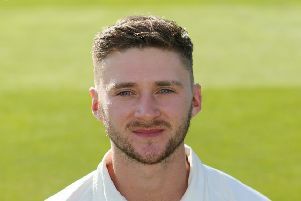 Raine had Lace caught at second slip and when skipper Billy Godleman edged one that moved late, Derbyshire were in danger of crumbling completely at 36 for 4. But Hosein, who scored a career-best unbeaten 138 against Leeds/Bradford MCCU last week, displayed the technique and temperament required to steer his side towards semi-respectability. Alex Hughes looked ready to dig in and survived for 16 overs until he drove loosely to cover point and Matt Critchley shared a stand of 56 in 18 overs before he was lbw to Gareth Harte. Hosein, who reached 50 from 106 balls, was also supported by Anuj Dal who helped add 50 before he edged Weighell to Poynter but the innings folded quickly after tea. Logan van Beek was bowled by Raine and although Hosein survived his only chance when Poynter dropped him on 73, it did not prove costly. Tony Palladino was yorked first ball by Weighell and when Ravi Rampaul took off for a quick single, Raine’s throw on the run from cover beat Hosein’s despairing dive. When Durham replied, the sun had broken through but batting was still demanding and Harte was close to edging the first ball from Rampaul to Hosein. Derbyshire’s bowlers were getting some swing and Reece made the breakthrough in the 10th over thanks to a stunning catch by Hughes. Harte’s edged drive was brilliantly taken one-handed as Hughes plunged to his right at second slip and Will Smith was lbw to a full length ball in Reece’s next over. The match was back in the balance when van Beek replaced Reece and his second ball hurried Michael Richardson into a miscued pull to mid-wicket. By now, the light had deteriorated even with the floodlights on and the umpires took the players off with three overs remaining and the match in the balance.